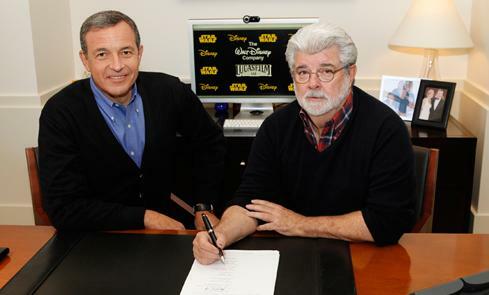 Sometimes you're going about your business, having a normal day and then Disney announces they are buying Lucasfilm! WHAT! - The biggest piece of news is obviously A NEW STAR WARS MOVIE. No, I am not going to stop using all caps inappropriately. Disney states they are on target for a new movie in 2015. Yes, Star Wars: Episode VII is a thing. - George Lucas says: ""It's now time for me to pass Star Wars on to a new generation of filmmakers. I've always believed that Star Wars could live beyond me, and I thought it was important to set up the transition during my lifetime. I'm confident that with Lucasfilm under the leadership of Kathleen Kennedy, and having a new home within the Disney organization, Star Wars will certainly live on and flourish for many generations to come. Disney's reach and experience give Lucasfilm the opportunity to blaze new trails in film, television, interactive media, theme parks, live entertainment, and consumer products." - More feature films are planned to grow the saga. - The press release does not mention the live action series that's supposedly almost ready to go. But maybe Disney would have the money needed to move forward? - It mentions the successful relationship between Lucasfilm and Disney on theme park attractions. Does this mean a whole Star Wars theme park? Just so long as they keep George the heck away from the scripts. Best possible curator for Star Wars, maybe even better than Lucas himself. A friend at Disney claims that Lucas has made no secret that he has always wanted Disney to take over the franchise. He gets his wish, apparently. I have to agree with the cautiously optimistic. I think that Disney is the right place for it, I think that they'll do some cool things with it as well. As for Episode 7... we'll see what happens and what they do with it. Good site with informative post. Liked it.